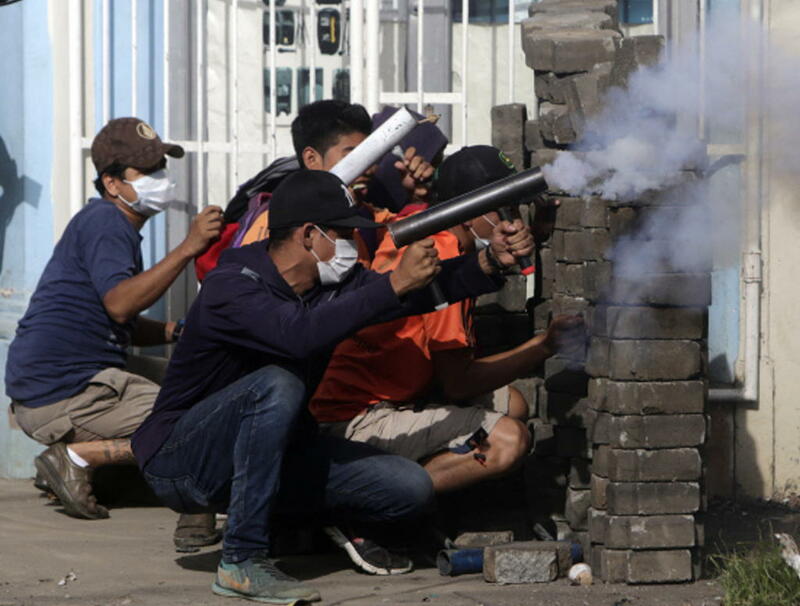 (AFP) Masaya, a city battling at the front lines of Nicaragua’s heated anti-government protests, once again became the scene of fierce street combat Saturday, with at least one man dying of a bullet wound to the heart, the head of a top rights group in the country said. Firearm bursts rang out in the city home to 100,000 people, where riots that started midday were growing increasingly violent as masked demonstrators wielding homemade mortars and slingshots struggled to fend off armed security forces. Alvaro Leiva, head of the Nicaraguan Association for the Protection of Human Rights (ANPDH), said at least one 60-year-old man had died after a bullet struck his heart. Leiva said the gunman was a sniper – implying a member of Ortega’s security forces or government-backed vigilantes. The mortal wound comes hours after the Nicaraguan Centre for Human Rights (CENIDH) had raised to 137 the death toll in the Central American country, where demonstrations demanding President Daniel Ortega’s ouster have raged since April 18. At least two people had died in violent protests overnight, the CENIDH told AFP, one in the northern city of Jinotega and another in Managua. Leiva said the situation was growing increasingly grave “because we are talking about crossfire, not tear gas or rubber bullets”. The city just outside of the capital – known before for its tree-lined streets, traditional crafts and nearby volcano of the same name – has taken on the appearance of a war zone. Demonstrators, many of them young men, huddled Saturday behind barricades constructed from cobblestones, felled trees and sheet metal, the ground littered with broken glass and spikes to further guarantee no cars would pass. “We are fighting here because of the massacre of many people, the death of many children,” one protestor told AFP, saying he’s been actively demonstrating in Masaya for 15 days. The young man who died in Jinotega was killed during an armed attack on protesters who were guarding a road barricade intended to keep security forces back, according to student organisers. “Paramilitaries linked to the government gunned down boys who were fighting in the streets for liberty and democracy,” said a statement from the city’s student movement, calling it “a night of terror”. In Managua, a young motorcyclist died from a bullet to the neck after two armed men aboard motorcycles chased and shot him. Demonstrators continued to block roads throughout Nicaragua as part of the mass protests demanding the removal of Ortega, a former guerrilla who has held office for 11 years but who faces increasing opposition, even from onetime allies. “Unfortunately they still aren’t showing political will – they continue to kill people,” one student leader, Victor Cuadras, told journalists upon landing in Managua after a trip to Washington. “They shed blood yesterday and early today,” he said of Ortega’s ruling Sandinista party. The crackdown that began as relatively minor demonstrations against pension cuts in April mushroomed into mass protests against Ortega, who first came to power in 1979 as the head of a communist junta following the overthrow of dictator Anastasio Somoza. A major force in Nicaraguan politics over the past four decades, Ortega slipped out of power in 1990 but retook the presidency in 2006. Now in his third consecutive term, he is to remain as the country’s leader until 2022. A key demand of protestors is to expedite that election. The country’s influential Catholic bishops met Thursday with Ortega to discuss a plan to reboot talks to quell the crisis, presenting “the pain and anguish of people who have suffered in recent weeks” to the leftist leader. Silvio Jose Baez, the auxiliary bishop of Managua, said Ortega “asked us for a period of reflection to give us an answer, which we asked he give us in writing” – after which they will consider the feasibility of reviving negotiations. But amid that administrative back-and-forth the situation continues to spiral out of control, activists and rights groups say. For young people fighting in Masaya, the conflict will not end until Ortega is gone. “We are in a war with the government,” a protestor in Masaya said, a black T-shirt veiling his face, his eyes barely visible beneath a black cap.